WaterMoon Breeze: stuff and scenery! The other night, though, I followed the usual SL chain of nice pointers and coincidences to WaterMoon Breeze, the sim and build and inworld store and probably also home of MenuBar Memorial, who (among many other things) made the wonderful crazy 50s-style Lucid Dream Together poster for Chasing a Butterfly, the machinima we posted about here the other week. Turns out this MenuBar feller has some Mad Skillz, and his stores (inworld and marketplace) contain some Really Neat Stuff. It’s Old SL stuff in the best way (crazy, fun, creative, offbeat, brightly colored), but also extremely polished. Not only can he script and do amazing things with particles (more on that below), but he also does graphic design like a person who does graphic design, so the offbeat brightly colored things actually look good! Spot the Pun in this one! and at the bottom, naturally, a Hieronymus-Bosch-based merry-go-round. So that is that! Another example of craziness and creativity in SL, for your consideration. Tiny beach shack! And non-tiny Garage! And stores! The copy pictured has some extra railings and underpilings because it is on the edge of a Huge Cliff, and also lots of pretty decorations an’ landscaping from the landlady :). The version that, um, I thought I had out for sale somewhere but apparently don’t yet (oops haha) is just the building itself, and is in fact just a smaller version of the usual Beach Shack. One thing that I in fact have put up for sale is the White Wood Garage, which is a garage made of white wood, and which goes nicely with the other buildings which are also made of white wood, in a matching sort of way (see prior posting). And while I am on the subject! 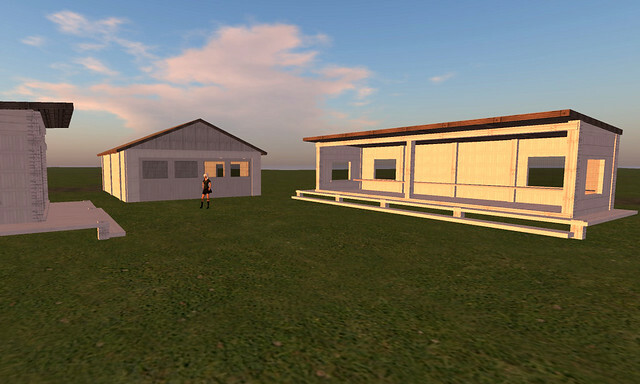 I apparently have not one but two (2) tiny little stores in SL now where I sell a tiny handful of things, including some of these White Wood buildings. One is in Hughes Rise (in the bottom of one of the two-level White Wood Sheds; comfy residential quarters are above), and the other is in the little Surf Shack on the famous Rag Dollz Island (which is probably not the best venue for a little shop which mostly sells things that aren’t clothes, but I loved the location and the rental rate). Here I am on the wall at VreMode, because of being a Elite SL Supermodel an’ all (I even have a group tag that says so!). Not far away, also on the wall, is a vendor for the Mulberry version that I bragged about the other day, also featuring pictures of me. zomg I have gone mad with ze products! Now just the garage one queued up. Until I build more and more and more! At last, Second Life residents have a place to dry their fish! Click through to exciting Marketplace store page! A mere 100L! Cheap at half the price! 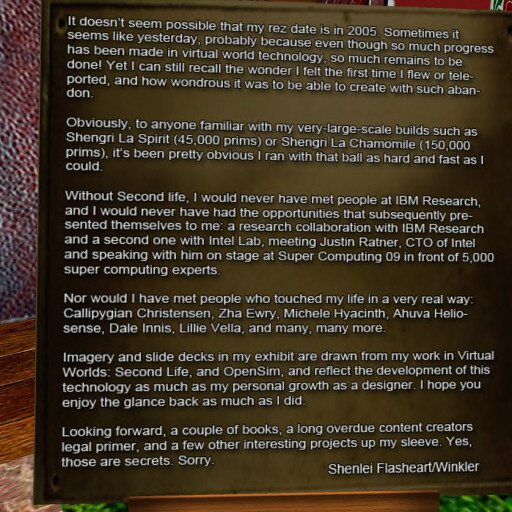 This is the welcome sign at Shenlei Flasheart’s SL10B exhibit. Seems like only yesterday, and ages ago, that we were all frolicking about on Shengri La, accidentally bringing the sim to its knees when temp prims stopped being temp, watching Shen enthusiastically spike overly bitey vampires, meditating in the streams, and generally having fun figuring out what all of this collaboration among creative people in these new-fangled “virtual worlds” was all about. Thanks, Shen, and everybody, for the memories, and also the ongoings, and the yet-to-bes! I have been having more fun building. Usually I start building something, decide I don’t like it, put it in inventory, and then mostly never see it again; but this white-wood beach-stuff theme is working out nicely for some reason. Here I am in some nice griefless sandbox some day recently, working on them. In addition to the existing Beach Shack (left), there is now a Beach Garage (center, with swinging-up front doors), and a Beach Fish-Drying or Stuff-Selling or Whatever Shed (right), with swinging-down back shelf for fish or stuff. I may eventually box these two (and the brick one, and the two darker-wood ones that I’m not sure are done yet) up to put into the Marketplace store also, once I’ve fiddled extensively with them for awhile. The shed is like 11 Land Impact, and the garage is like 21 (for some reason fiddling around with physics type isn’t helping any there at the moment). The brick one is 17, I think (and has two floors! ).